Ever since Marco Polo wrote about his travels to China, the faraway East’s culture of extreme refinement has piqued the imagination of the world’s rulers, tastemakers, artisans, and artists. Louis XIV kept decorative arts from China in his private apartments at Versailles. Coco Chanel so loved Chinese screens that she eventually owned more than thirty. The Duke and Duchess of Windsor had the walls of their Bois de Boulogne villa hand-painted with Chinoiserie, these charming pastiches of designs and scenes from China, Japan, and other Asian countries. More recently, interior designer Brian J. McCarthy has extolled the appeal of furnishings from or influenced by the East, and featured an Asian-inspired 18th-century black-lacquered Dutch tray table in his own Manhattan living room. From imported Japanese lacquerware and Chinese huanghuali furniture to Western reinterpretations of Eastern shapes and motifs, the Asian decorative arts style has remained chic through the ages because of its ability to combine diverse aesthetics. Often incorporated into traditional surroundings or over-the-top baroque interiors both perfect backdrops for a lavish 18th-century Dutch painted leather screen, say, or a richly carved and inlaid 19th-century Chinese cabinet with flower-like drawer pulls these forms also fit right into modern or contemporary settings. Sleek and black with gold detail, an early 19th-century Regency-style Japanned cabinet would confer authority to any study or library. Conversely, the rich orange surface and delicate birds and blossoms of a 19th-century Qing Dynasty famille rose porcelain garden stool would awaken a minimalist living room. 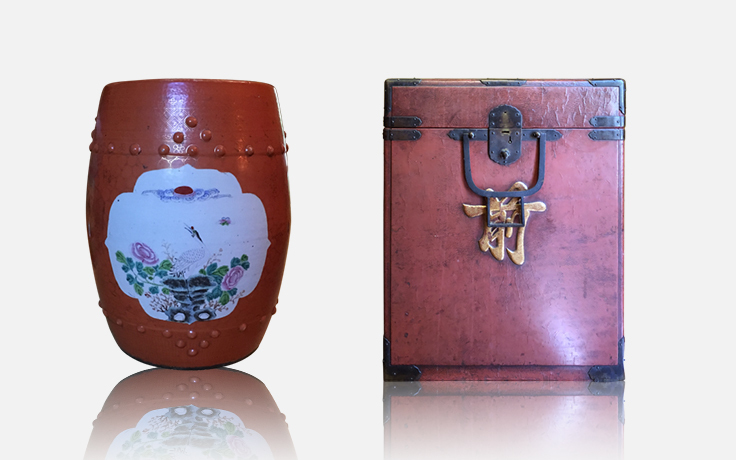 Finally, what could be more classic than an early 20th-century Chinese red-lacquered leather trunk? In combining rich patina, striking metal designs and humble locks, nailheads, and heavy oblong handles, this arresting object may well crystallize the endless allure of the East.